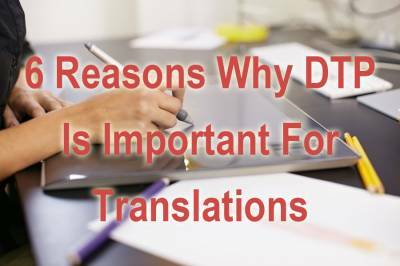 Perhaps you have sent a translation or localization project to a professional translation company who recommended that in addition to the typical translation, editing and proofing, you add Desktop Publishing (DTP) to your project. You may be wondering, why do I need a language service provider to perform my desktop publishing? Why can’t my design team manage the layout? Read on to learn 6 reasons why desktop publishing is a vital component to any translation or localization project. What Is Multilingual Desktop Publishing? Multilingual Desktop publishing is typically one of the last phases in a translation or localization project and involves using the source language document or file to reproduce the layout in the target language(s) while performing all the necessary technical and cultural adaptations. The ultimate goal of desktop publishing is to deliver a document that looks as if it were originally created in the target language. A good professional translation services company will provide finalized print-ready documents and/or screen-ready localized online or digital materials. Upon delivery, you should not need to perform any additional work. Why Use A Professional Language Service Provider For Your Desktop Publishing? 1. Multilingual desktop publishing experts typically can work in any file type and format. This can be particularly handy when you only have a .pdf file to submit. They in effect can recreate your file. A professional translation or localization company is well versed in providing multilingual desktop publishing services. As part of their day-to-day operations, they lay out documents using multiple software and file formats in multiple languages and scripts. Character-based languages, such as Chinese, Japanese and Korean, require specific versions of even standard publishing software installed on the native (non-US) platform to generate localized documents for the target users. A good language service provider will not be stymied by any script, file or font type. 2. Having your language service provider perform your desktop publishing is particularly helpful for complex languages and complicated characters. Language service providers are experts in working with foreign language text. Many translation and localization projects involve bidirectional (or BiDi) characters, complicated characters such as double-byte Asian languages or languages that expand or contract. Depending on the source and target languages, text size may expand or contract. For example, documents translated from English to languages such as French, Spanish and Arabic expand in word count and require more space or smaller font size. German and Russian words can be dozens of characters long, requiring re-sizing of graphics and menu items. Bi-directional languages, such as Arabic, Hebrew and Farsi change the order of layout because they are written right to left, but can also support left-to-right display. Multilingual desktop publishing experts can modify the layout or design to accommodate these differences in size and display direction. 3. Language service providers can make desktop publishing recommendations to optimize your project’s look and feel. Translation of documents from one language to another has substantial impact on the graphical layout of documents. Professional language service providers have specific knowledge of the target language and audience your project is trying to reach. Countries may have their own standards when it comes to the look and feel of your final project. For example what is acceptable in the United States may not be acceptable in Russian, Saudi Arabia or Japan. A professional language service provider has Fingerspitzengefühl (or literally, “fingertip feeling”) for the local language and target audience and can make recommendations for the best layout and design of your translation to communicate with your target audience. They may recommend flipping layouts or choosing colors and images that will better communicate your message to your audience. 4. Desktop publishing can critically impact your translation or localization project. You may be tempted to think that so long as you hired a top quality translation company, the DTP and layout are not as important. In fact, the DTP can have a drastic effect on your final project regardless of how good the translation is. For example, improper desktop publishing, layout and typographical errors could lead to a poor impression of your company, regulatory rejection of your product or even lawsuits if your high-risk, high-value information has mistakes due to wrong formatting. A professional language service provider has experience with formatting for regulatory compliance, for cultural adaptation and for different fonts, scripts and locales. 5. Language service providers are language experts. Although your own in-house designers may be reluctant to relinquish their designs to a language service provider, the designers are not qualified to work in other languages. They may create mistakes or confusion in the final layout that stems from not knowing the language. For example, they may break a word or phrase that belongs together in its original language. They may also neglect proper punctuation for foreign languages such as French or Spanish. They may not have experience working with unfamiliar scripts such as Chinese, Hebrew or Russian. A professional translation or localization company knows the translation and what line breaks or punctuation rules are acceptable and will best convey your message. At the end of the project, a final linguist checks the work to make sure that everything is accurate, and that no mistakes were introduced through desktop publishing. 6. DTP by a professional translation company saves time, money and resources. Professional language service providers have international teams able to work 24/7 around the clock to meet your rushed deadlines. Even if you at first believe your own design team can beat the price quoted for DTP, it may end up costing you in the long run. Do you want to trust your final design to someone who does not understand the words they are working with? Even if you give the work back to your linguist to do a final proof, you will still have to factor in lost time and resources that come from having to rework formatting errors and revisions. When your design team takes on a layout project in a language that you and they do not understand, you take on a risk. Working with a professional language service provider that employs expert multilingual desktop publishers is the best way to ensure that the translation you invested in is best presented to your target audience(s) as intended. What experiences have you had with multilingual desktop publishing? Please share your tips in our comments section. Also, if you feel this post has helped you better understand the importance of using professional multilingual desktop publishers, please like and share it socially.